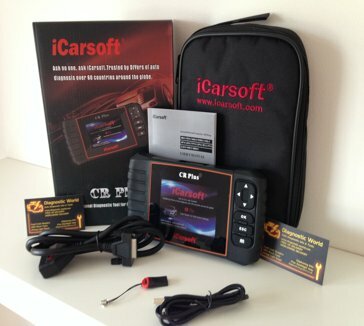 CR Plus is a professional and powerful vehicle fault diagnosis tool developed by iCarsoft Technology Inc. With a 4” TFT LCD and unique diagnostic software, it features full ECU diagnosis of single vehicle brand and test modes mainly include: CANBUS, ISO9141, KWP2000, J1850 etc. It will enable technicians to accurately diagnose complex problems. ● CR Plus can do it all-reads and clears trouble codes on all the systems such as engine, transmission, ABS and airbag etc.